My grandmother has been researching my mother's side of our family (Kelly, Hussey, Hursey, Ulrich, Turner, Jordan, Anderson, Gee, Heath) since September of 1956 - almost 60 years, give or take. She kept notes of all of her research in spiral bound notebooks and on notebook paper. She has folders of copies of book pages and vital documents. In among her own notes and copies, she has original handwritten letters from her parents and my grandfather's parents of their own personal knowledge and other such gems. It's an incredible collection of family papers. She recently moved and I was gifted with two boxes of this research. It's like a genealogist's dream - and also represents a slight preservation crisis. Some of the pages were already fading away and disintegrating. I felt a terror that only a genealogist geek could feel when I unearthed a yellowed page with a family tree that could no longer be clearly read. This is my first paper preservation project but I do have a bit of experience storing vital docs for longevity so I had a wee bit of knowledge and boned up quickly on what else I needed to have. Here's the basics. When someone later researches you or your parents or children, they will want to know who they were, what their names were, where they lived, military service, education, career, children, marriages, religion and any big life stories. These are all things someone will want to be able to prove or disprove later or that will lead them to sources which might have more detailed records of you or your family member. Consider keeping any piece of paper that yields any of this information. This might include a school record summary, a diploma or certificate, a marriage license, birth and death certificates, letters, court case decrees, company ID badges etc. Further than keeping them though, you'll want to make sure they are usable - not just by your family genealogist but viewable by your children and grandchildren etc. so that they can read about their ancestors too! To avoid further deterioration, you want to protect the paper from any further degradation. This boils down to lots of physical steps you can take to protect your documents from heat, moisture, insects, rodents, light and dust and dirt. The ideal conditions for your papers are at a temperature cooler than 75 degrees Fahrenheit and the relative humidity below 65%, according to The U.S. National Archives and Records Administration. The Library of Congress adds that documents should be protected from light and that their protective enclosures should also be supportive to help hold them together while being viewed. So you're looking for a cool, dark, dry place. Although it's tempting to store your papers in your basement where it's cool, basements are not known for being exceptionally dry. An attic, although hopefully dry, is likely to be hot. Both are known for harboring pests because they are typically the least populated and therefore the least noticed parts of a home. Options might include a special, controlled storage enclosure in either location, a cool dark corner of a closet in your home or even a location in a garage, depending upon how you use your garage. The climate of where you live and condition of the various areas of your home will dictate your in-home options. Put your documents, in their storage containers (below), on a shelf off of the floor to protect from flooding. Ask your storage facility about flooding and fire infrastructure that will keep your priceless papers safe in the case of a disaster. Keep your papers near food, where pests are more likely to be. The most important thing you might now know about paper is that it is acidic. Although more acid free papers are being produced, older or less expensive paper is generally acidic. Over time, even if it is properly stored, an acidic paper will get brittle, turn yellow and break down or degrade. You can expect regular old acidic paper to last about 500 years before it's powder. But between day one and 500 years, it becomes progressively harder to read and more delicate. My grandmother has an envelope addressed to my third great grandfather is over 100 years old. In a few more generations, it might deteriorate entirely. lignin releases acid as it ages. Papers with lignin in them, while they might be acid free, will become more acidic over time. PVC emits hydrochloric acid over time - eep! In general, everything that comes into contact with the papers should be acid free, PVC (Polyvinyl chloride) free, lignin free, clean and dry. Look for the words 'PVC Free', 'acid free' and/or archival quality on any products you use with your papers. This includes folders, binders and boxes that you keep them in. Sheet protectors can be an easy way to store a document. Avery offers a box of 100 acid free sheet protectors for about $9- or a box of 50 of a more heavyweight version for about the same price. The heavyweight protectors offer more structure but ultimately, in a pinch, either version will protect your paper better than neither version. The page should be protected in a way that allows you to leave it in it's protection without removing it. It should not protrude from it's enclosure (like sticking out of the top of the sheet protector). Seal up the top of your sheet protector with acid free scrapbooking tape. It's really easy to do. Slip your piece of paper into the sheet protector. Then, careful to not touch the paper with the tape, only the sheet protector, put a strip of scrapbooking tape across the top of the sheet protector and fold it over to the other side to seal the sheet protector entirely. Some paper fades more easily than others, some is more fragile. Some has more acid or less acid. For this reason, it's best to keep each piece separate from other pieces. If they must be stored together, consider putting a piece of acid free tissue paper or lignin and acid free paper to separate pieces of paper. If you know that you are dealing with acidic papers, try a buffered tissue paper. Store your pages, in their sealed sheet protectors, in a plain old PVC free binder - or something a little nicer, also PVC free - or maybe skip plastic altogether and go with a leather binder, which has it's own preservation needs but will not degrade the paper. If you use file folders, make sure you are using acid and PVC free file folders! I like these poly PVC free folders because they offer some additional water resistance. 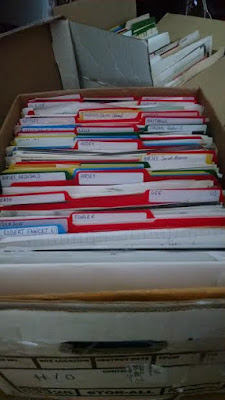 And finally, if you're using file folders or if you are storing your binders, store them in a sealable, PVC free, plastic box to avoid moisture. You might have noticed that some of these supplies are labeled for scrapbooking. Because scrapbooking involves paper, most scrapbooking supplies are made to be paper safe. When you handle your papers, make sure your hands are freshly washed and that you aren't eating or drinking near them. Consider using cotton gloves or even disposable latex and powder free gloves. Make your own notes using acid free ink in an acid free paper notebook to avoid fading. If you print out vital documents, print them on acid free printer paper. Do not laminate, tape, coat, staple or use paper clips on your paper. Staples and paperclips rust, lamination and tape are irreversable and destroy the document. Do not use pens to notate your document. If you must write on it, use a pencil. Having a digital copy of your original makes it much easier to share with others and gives you a second copy in case something happens to the original. Scan or photograph your original and store it the manner that works for you. I store my geneaology documentation in evernote. If you are not good at scanning or imaging, consider allowing a professional to scan them for you. Making a seemingly innocuous mistake on format or resolution can make the files unusable later. I recommend staying away from easily removable media because, not only are they more easily lost or damaged, those tend to become outdated more quickly. Remember floppy disk drives? Instead, back up to an external hard drive, which is more likely to be accessible from any computer in the foreseeable future. Have you ever needed that one document to prove ancestry only to find out that the courthouse burned down in the 1800s and the documents no longer exist? My heart aches every time I run into that. I can't imagine how many personal troves of family memorabilia have been lost that way if government offices have fallen victim to it. Store your irreplaceable items in fireproof and/or waterproof boxes or filing cabinets, depending upon what you are most likely to experience in your area. They can be pricey. But after 30 years of collecting original documents, your collection might be worth the extra $50 for a fireproof filing box or even $2,000 for a fireproof filing cabinet. Check craigslist or ebay for cheaper used alternatives but ensure that when you get it, the shell or casing has not been damaged or compromised in any way - and research the fireproof rating of the model you are purchasing online before you buy it. If you store your images electronically, make sure that your files are backed up. Consider backing them up to the cloud if your originals are on your computer - or backing up to your computer if your originals are stored in the cloud. Print out hard copies of your family tree every so often to store with your genealogy go bag (you have one of those right... everyone does?) or paper files.